Q: What kind of surfaces can my die-cut stickers stick to? A: Die-cut stickers can be stuck to pretty much any surface! Because of their thickness, our die-cut stickers can stick to many uneven facets without tearing. If you wish to remove your die-cut sticker, we recommend applying it to smooth flat surfaces for best results. Q: Can I put die-cut stickers on a baseball helmet or other round surface? A: Because our vinyl sticker material stretches better than BOPP materials, it is possible to apply them perfectly on rounded surfaces, although they may not adhere well to perfect spheres. Q: How thick are your die-cut stickers? 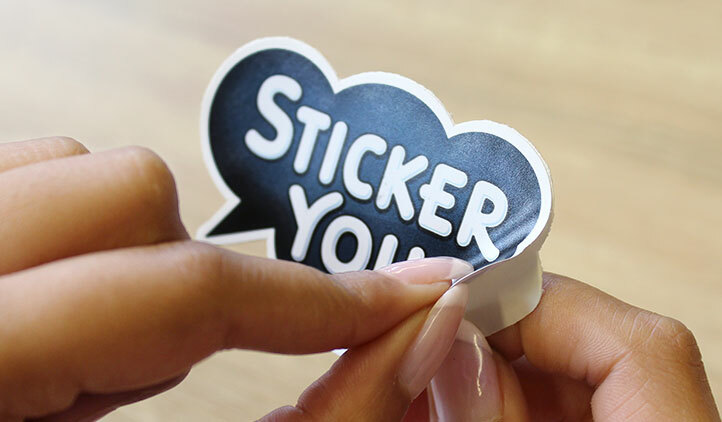 A: Our die-cut stickers are printed on high quality vinyl approximately 0.15mm in thickness, the same thickness as your average cardstock paper. Q: I want the shape of my die-cut sticker to be contoured around the shape of my design. Will this cost extra? A: Nope! Our die-cut singles are similarly priced to our other vinyl stickers. As with most of our other sticker products, we have no order minimums on our die-cut stickers. Order as many or as little die-cut stickers as you want, the cost will be the same no matter what shape your design is in! Q: Is it difficult to apply my die-cut stickers? A: Die-cut sticker application is incredibly simple! After peeling the back off your die-cut sticker, we recommend you apply your die-cut sticker starting from the middle first. From there, smooth out any air bubbles with a card and your hand. To remove your die-cut stickers, simple pick an edge or corner and start peeling away (because of their thickness, getting a good grip on a die-cut sticker is effortless). Q: Can I customize the size of the white border on my die-cut stickers? 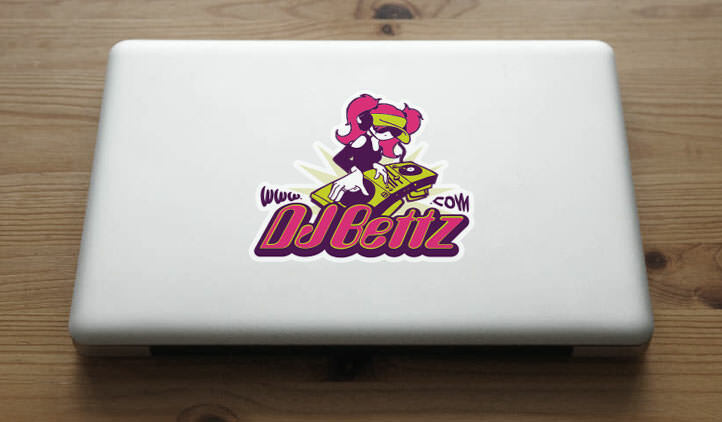 A: At StickerYou we take customization very seriously from image to edge! The white border on die-cut stickers is 1/10” to avoid cutting into your sticker’s image. However, this border can be changed to be any color you like - and we do mean any color. To avoid a white border and create a custom bleed effect, use the eyedropper tool in our sticker editor to create a border of the outermost color of your sticker, or a transparent one. Watch a quick how-to video here. Q: Do die-cut stickers take longer to make than your other sticker products? A: Absolutely not! As soon as your submit your order, your design goes under review and is sent directly to the printer! Printing, cutting, and shipping die-cut stickers takes only 4-10 days. Your die-cut stickers will be bundled up and stacked to minimize damage and maximize die-cut-sticking efficiency, then delivered to your door. Q: There’s a part of my die-cut sticker that I’d like to have cut out, is there a way to select that online? A: Unfortunately, having a second die-cut within your die-cut sticker is impossible at this time due to our die-cut sticker printing process. If you’d like part of your logo or design to have cut-outs, you can easily achieve so with our vinyl graphics! Q: What is 'removable adhesive'? 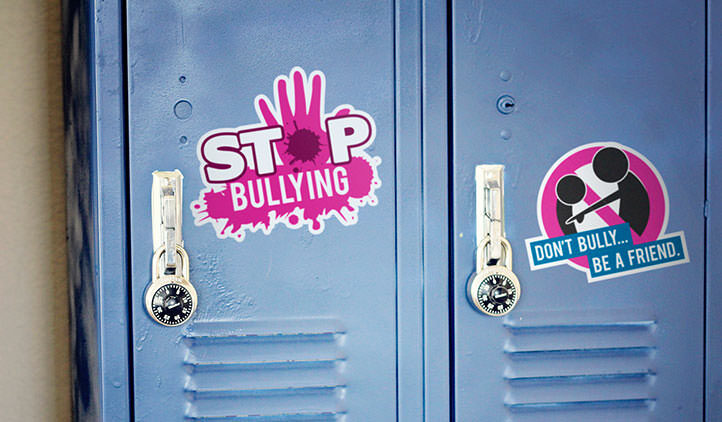 A: Our die-cut stickers are made with durable adhesive that is made to stay strong anywhere you stick it. 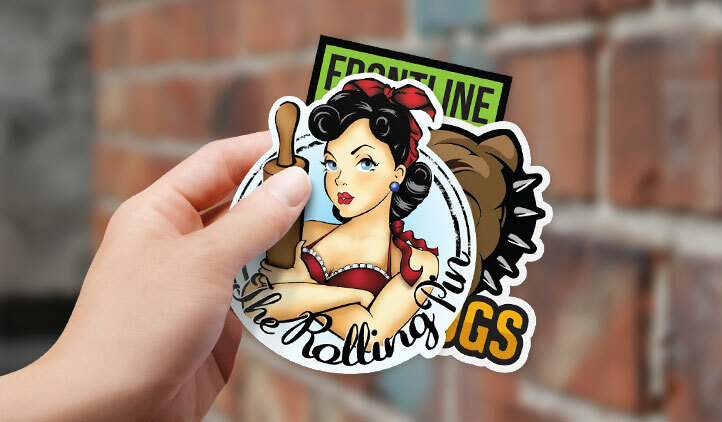 However, the durable vinyl material your die-cut stickers are actually made of make it so that you can remove your sticker if you want to reposition it or place it elsewhere. 'Removable adhesive' also means our die-cuts won't leave any sticky residue on your things when you want to change things up.